Moravec’s Paradox is a principle discovered by AI robotics expert Hans Moravec in the 1980s. He discovered that, contrary to traditional assumptions, high-level reasoning requires relatively little computation power, whereas low-level sensorimotor skills require enormous computational resources. The paradox is sometimes simplified by the phrase: Robots find the difficult things easy and the easy things difficult. This explains why we can now create specialized AI, such as predictive coding software to help lawyers find evidence, or AI software that can beat the top human experts at complex games such as Chess, Jeopardy and Go, but we cannot create robots as smart as dogs, much less as smart as gifted two-year-olds. Also see the possible economic, cultural implications of this paradox as described, for instance, by Larry Elliott, in Robots will not lead to fewer jobs – but the hollowing out of the middle class (The Guardian, 8/20/17). Hans Moravec is a legend in the world of AI. An immigrant from Austria, he is now serving as a research professor in the Robotics Institute of Carnegie Mellon University. His work includes attempts to develop a fully autonomous robot that is capable of navigating its environment without human intervention. Aside from his paradox discovery, he is well-known for a book he wrote in 1990, Mind Children: The Future of Robot and Human Intelligence. This book has become a classic, well-known and admired by most AI scientists. It is also fairly easy for non-experts to read and understand, which is a rarity in most fields. Moravec is also a futurist with many of his publications and predictions focusing on transhumanism, including Robot: Mere Machine to Transcendent Mind (Oxford U. Press, 1998). In Robot he predicted that Machines will attain human levels of intelligence by the year 2040, and by 2050 will have far surpassed us. His prediction may still come true, especially if exponential acceleration of computational power following Moore’s Law continues. But for now, we still have a long was to go. The video below gives a dramatic example. A recent interview of Horoshi Yamakawa, a leading researcher in Japan working on Artificial General Intelligence (AGI), sheds light on the Moravec Paradox. See the April 5, 2017 interview of Dr. Hiroshi Yamakawa, by a host of AI Experts, Eric Gastfriend, Jason Orlosky, Mamiko Matsumoto, Benjamin Peterson, and Kazue Evans. The interview is published by the Future of Life Institute where you will find the full transcript and more details about Yamakawa. In his interview Horoshi explains the Moravec Paradox and the emerging best hope for its solution by deep learning. The field of AI has traditionally progressed with symbolic logic as its center. It has been built with knowledge defined by developers and manifested as AI that has a particular ability. This looks like “adult” intelligence ability. From this, programming logic becomes possible, and the development of technologies like calculators has steadily increased. On the other hand, the way a child learns to recognize objects or move things during early development, which corresponds to “child” AI, is conversely very difficult to explain. Because of this, programming some child-like behaviors is very difficult, which has stalled progress. This is also called Moravec’s Paradox. However, with the advent of deep learning, development of this kind of “child” AI has become possible by learning from large amounts of training data. Understanding the content of learning by deep learning networks has become an important technological hurdle today. Understanding our inability to explain exactly how “child” AI works is key to understanding why we have had to wait for the appearance of deep learning. Horoshi Yamakawa calls his approach to deep learning the Whole Brain Architecture approach. 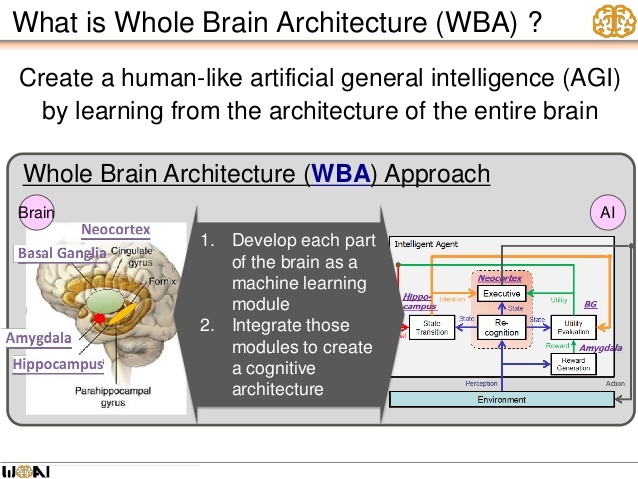 The whole brain architecture is an engineering-based research approach “To create a human-like artificial general intelligence (AGI) by learning from the architecture of the entire brain.” … In short, the goal is brain-inspired AI, which is essentially AGI. Basically, this approach to building AGI is the integration of artificial neural networks and machine-learning modules while using the brain’s hard wiring as a reference. However, even though we are using the entire brain as a building reference, our goal is not to completely understand the intricacies of the brain. In this sense, we are not looking to perfectly emulate the structure of the brain but to continue development with it as a coarse reference. Yamakawa sees at least two advantages to this approach. Act Now for AI Safety? As part of the interview Yamakawa was asked whether he thinks it would be productive to start working on AI Safety now? As readers here know, one of the major points of the AI-Ethics.com organization I started is that we need to begin work know on such regulations. Fortunately, Yamakawa agrees. His promising Whole Brained Architecture approach to deep learning as a way to overcome Moravec’s Paradox thus will likley have a strong ethics component. Here is Horoshi Yamakawa full, very interesting answer to this question. I do not think it is at all too early to act for safety, and I think we should progress forward quickly. Technological development is accelerating at a fast pace as predicted by Kurzweil. Though we may be in the midst of this exponential development, since the insight of humans is relatively linear, we may still not be close to the correct answer. In situations where humans are exposed to a number of fears or risks, something referred to as “normalcy bias” in psychology typically kicks in. People essentially think, “Since things have been OK up to now, they will probably continue to be OK.” Though this is often correct, in this case, we should subtract this bias. If possible, we should have several methods to be able to calculate the existential risk brought about by AGI. First, we should take a look at the Fermi Paradox. This is a type of estimation process that proposes that we can estimate the time at which intelligent life will become extinct based on the fact that we have not yet met with alien life and on the probability that alien life exists. However, using this type of estimation would result in a rather gloomy conclusion, so it doesn’t really serve as a good guide as to what we should do. As I mentioned before, it probably makes sense for us to think of things from the perspective of increasing decision making bodies that have increasing power to bring about the destruction of humanity.